Hot Topic – What Does A Healthy Weight Mean For You? Do you struggle with unrealistic expectations about your weight? 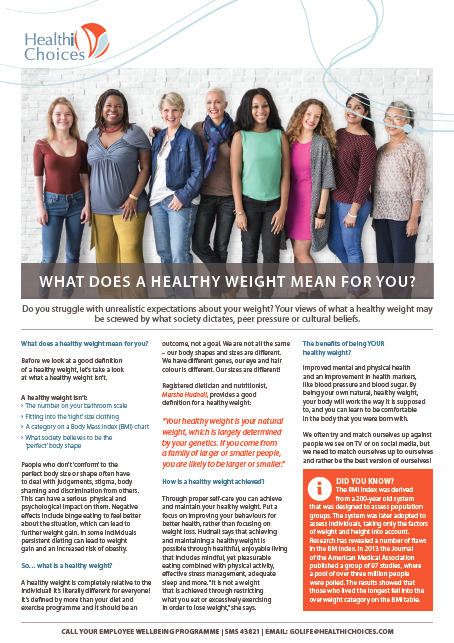 Your views of what a healthy weight is may be skewed by what society dictates, peer pressure or cultural beliefs. 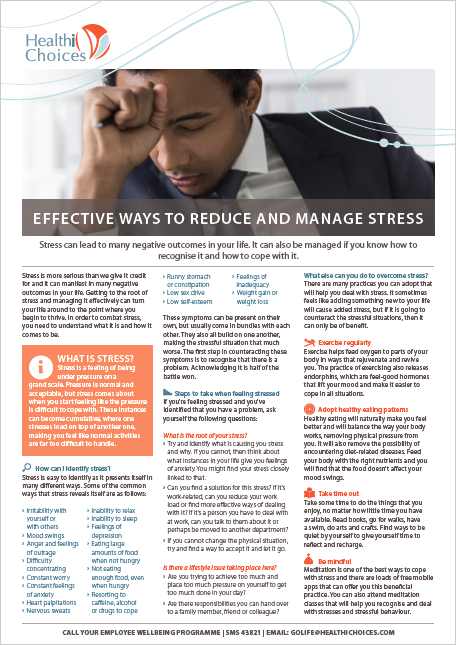 Stress can lead to many negative outcomes in your life. It can also be managed if you know how to recognize it and how to cope with it. Gone are the days that we lived within walking distance from our places of work. Some lucky few still do, but for the rest of us, there is the great commute. Luckily there are many different options for commuting. We all have arguments with our partners from time to time. Some more than others. 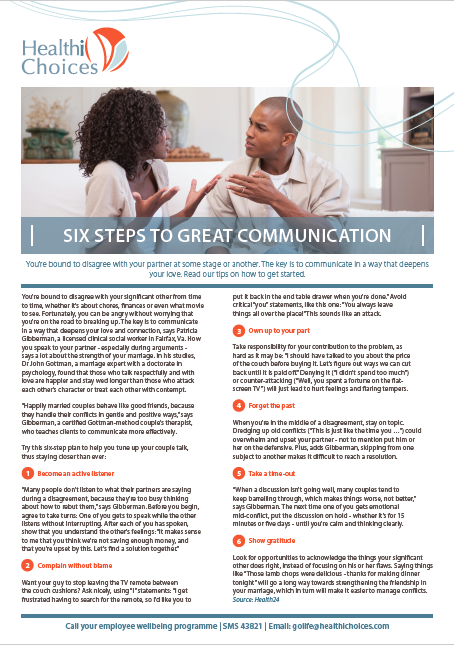 Often our disagreements or misunderstanding can come from a lack of communication. This can easily be avoided if you follow these steps. 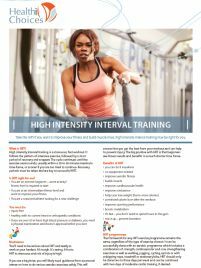 High intensity interval training is a strenuous, fast workout. It follows the pattern of intensive exercise, followed by a short period of recovery and a repeat. The cycle continues until the exercise session ends, usually within a 20 to 30 minute maximum time frame, or sooner if you are too tired to continue. Why not take a good look at your taxes? Perhaps you can pay less tax this financial year. 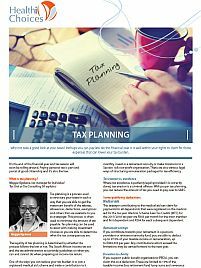 It is well within your rights to claim for those expenses that can lower your tax burden. The word listeriosis has struck fear into the hearts of South Africans. According to the World Health Organisation (WHO), South Africa’s current outbreak is the largest ever reported worldwide. 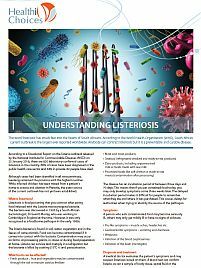 Anybody can contract listeriosis but it is a preventable and curable disease. 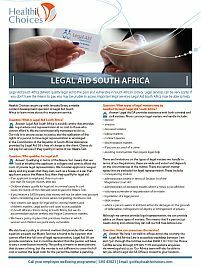 Legal Aid South Africa delivers quality legal aid to the poor and vulnerable in South African society. Legal services can be very costly. If you don’t have the means to pay, you may be unable to access important legal services. Legal Aid South Africa may be able to help. How someone looks on the outside is not always an indication of how fit or healthy they are. 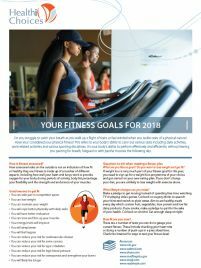 Fitness is made up of a number of different aspects, including how well your heart and lungs work to provide oxygen for your body during periods of activity, body fat percentage, your flexibility and the strength and endurance of your muscles. There may be a time in your life when you are faced with a situation that requires legal support. 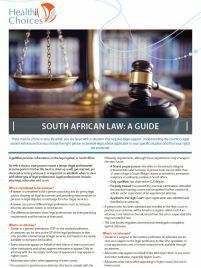 Understanding the country’s legal system will ensure that you choose the right person to provide legal advice applicable to your specific situation and that your rights are protected. Say no to violence against women and children. Violence against women and children is a fundamental violation of human rights. A third of women in South Africa experience abuse and over 100 new child abuse cases are reported in the country every week. 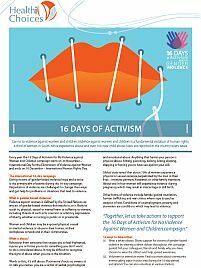 Every year the 16 Days of Activism for No Violence against Women and Children campaign starts on 25 November – International Day for the Elimination of Violence against Women and ends on 10 December – International Human Rights Day. HIV when treated appropriately, is no longer a life-threatening disease, but rather a manageable chronic illness. 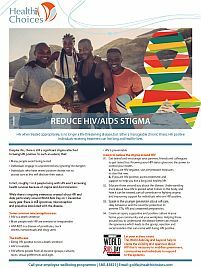 HIV positive individuals receiving treatment can live long and healthy lives. Despite this, there is still a significant stigma attached to being HIV positive. In fact, roughly 1 in 8 people living with HIV aren’t accessing health services because of stigma and discrimination. While there is ongoing awareness created about HIV and Aids, particularly around World Aids Day on 1 December every year, there is still ignorance, misconception and prejudice associated with the disease. 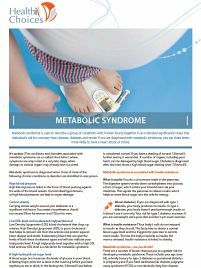 Metabolic syndrome is used to describe a group of conditions which when found together in an individual significantly raises that individual’s risk for coronary heart disease, diabetes and stroke. If you are diagnosed with metabolic syndrome, you are three times more likely to have a heart attack or stroke. Managers are responsible for making sure that individuals within their teams have the tools and skills required to reach their full potential. The improvement and development of the skills of team members benefits the team as a whole. Managers may be called on to tutor individuals who are facing personal and professional challenges. 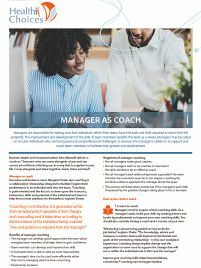 In essence, the manager is called on to support and coach team members to facilitate their growth and development. Stress, depression and anxiety are a part of modern day life. 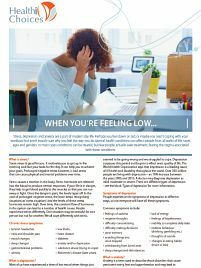 Perhaps you feel down or sad, or maybe you aren’t coping with your workload but aren’t exactly sure why you feel the way you do. 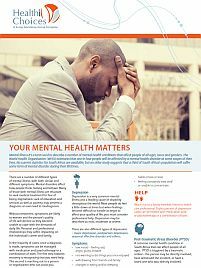 Mental health conditions can affect people from all walks of life, races, ages and genders. In most cases conditions can be treated, but few people actually seek treatment, fearing the stigma associated with these conditions. Healthy people are happier, more sociable and more productive at work according to research. But what defines being healthy? 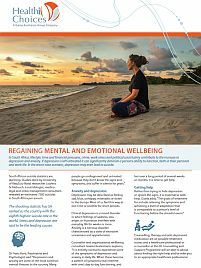 Health and wellbeing refer to a state of the body where there is an absence of disease, both physical and mental. Thus, being healthy means that you feel good in body and mind, making you more likely to be motivated in your work day, to cope better with stress and to have a stronger immune system. Did you know that your oral health impacts on the overall health of your body? 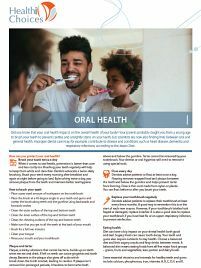 Your parents probably taught you from a young age to brush your teeth to prevent cavities and unsightly stains on your teeth, but scientists are now also finding links between oral and general health. Improper dental care may, for example, contribute to disease and conditions such as heart disease, dementia and respiratory infections. On August 9, South Africans come together to celebrate National Women’s Day. The day is a commemoration of the 1956 women’s march to the Union Buildings in Pretoria against the pass laws of the time. 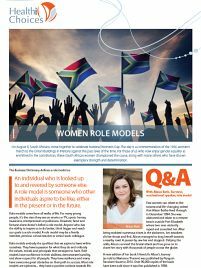 For those of us who now enjoy gender equality as enshrined in the constitution, these South African women championed the cause, along with many others who have shown exemplary strength and determination. Ethics are moral principles which not only distinguish right from wrong but also rights and responsibilities in terms of the law. Ethics are usually structured and adopted by a group of people. It dictates their conduct and behaviour towards their organisation, company, association or society. 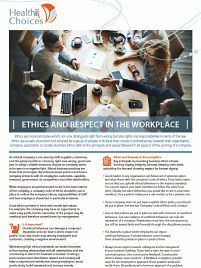 Business ethics refer to the principals and values followed in all aspects of the running of a company. Your body comprises cells, tissues and organs that work in harmony and function as a whole. Groups of cells form tissue, and organs are made up of several tissue types. Organs that work in partnership form a system. 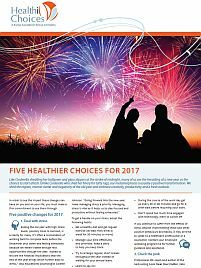 The choices you make today – what you put inside or do with your body – have an impact on your current and future health. 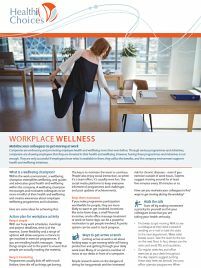 Companies are embracing and promoting employee health and wellbeing more than ever before. Through various programmes and initiatives, companies are showing employees that they are invested in their health and wellbeing. However, having these programmes and initiatives is not enough. 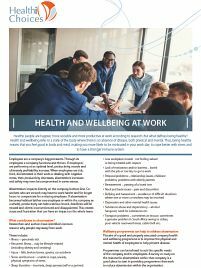 They are only successful if employees know what is available to them; they utilise the benefits, and the company environment supports health and wellbeing initiatives. 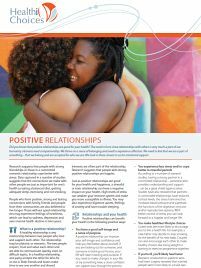 Did you know that positive relationships are good for your health? The need to form close relationships with others is very much a part of our humanity. Humans need companionship. We thrive on a sense of belonging and need to experience affection. We need to feel that we are a part of something – that we belong and are accepted for who we are. We look to those closest to us for emotional support. 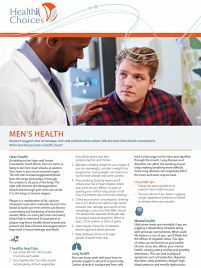 According to the Heart and Stroke Foundation of South Africa, men are twice as likely to die from heart attacks as women. Your heart is your most essential organ. The left side receives oxygenated blood from the lungs and pumps it through the arteries to all parts of the body. The right side receives the deoxygenated blood back through your veins and sends it to the lungs to receive oxygen. When last did you have a health check? Do you know where your money goes each month? Less than 8% of South Africans have a monthly budget. A budget can empower you financially and guide you to better spending and saving patterns. A budget can also alert you to problem areas in your finances that need to be addressed. A budget is a physical list of what you earn on a monthly basis and a breakdown of how you spend that money. A budget gives you a good insight into your financial situation. If you want a new car or a pair of expensive leather boots, your budget will tell you whether you can afford them or not. Did you know that your daytime habits can have an impact on your quality of sleep and how alert you are the following day? ‘Sleep hygiene’ refers to a number of practices you can adopt to ensure a better night’s sleep. 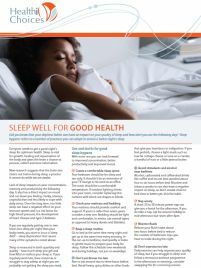 Everyone needs to get a good night’s sleep for optimum health. Sleep is vital for growth, healing and rejuvenation of the body and gives the brain a chance to process, collect and store information. New research suggests that the brain also cleans out toxins during sleep, a process it cannot do while we are awake. 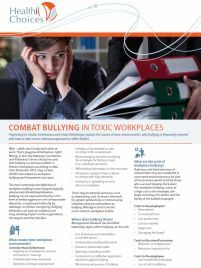 Psychologists Shoba Sreenivasan and Linda Weinberger explain the causes of toxic environments, why bullying is frequently ignored and how to take a zero-tolerance approach to office bullies. Wait – adults don’t bully each other at work. That’s playground behaviour, right? Wrong. In fact, the Advisory, Conciliation and Arbitration Service (Acas) has said that bullying is a serious problem in Britain’s workplaces; according to data from November 2015, they receive 20,000 calls related to workplace bullying and harassment each year. 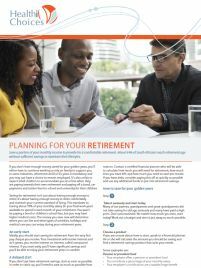 Save a portion of your monthly income to provide for a comfortable retirement. About 94% of South Africans reach retirement age without sufficient savings to maintain their lifestyles. If you don’t have enough money saved for your golden years, you’ll either have to continue working or rely on family to support you. In some industries, retirement at 60 or 65 years is mandatory and you may not have a choice to remain employed. It’s also unfair to expect adult children to accommodate you at a time when they are paying towards their own retirement and paying off a bond, car payments and tuition fees for school and university for their children. 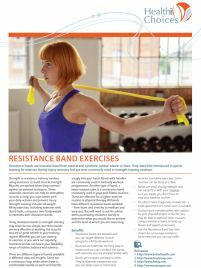 Strength or resistance training involves using resistance to build muscle strength. Muscles are worked when they contract against an external resistance. These anaerobic exercises can help to strengthen muscles to help you cope better with your daily activities and prevent injury. Strength training includes all weight lifting exercises, including exercises with dumb bells, using your own body weight or exercises with resistance bands. Every part of your body needs energy to function. Maintaining steady energy levels throughout the day makes it easier to focus and be productive. 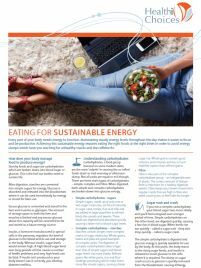 Achieving this sustainable energy requires eating the right foods at the right times in order to avoid energy slumps which have you reaching for unhealthy snacks and the caffeine fix. 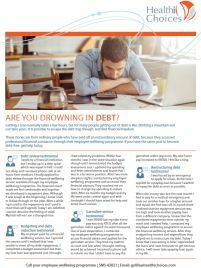 Hot Topic – Are you drowning in debt? Getting a loan normally takes a few hours, but for many people getting out of debt is like climbing a mountain and can take years. It is possible to escape the debt trap though, and find financial freedom. 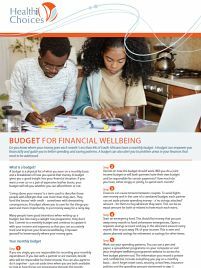 These stories are from ordinary people who have paid off an extraordinary amount of debt, because they accessed professional financial assistance through their employee wellbeing programme. If you have the same goal to become debt-free, get help today. 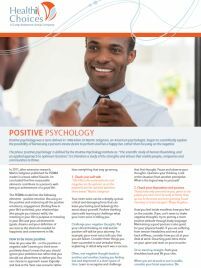 Positive psychology is a term defined in 1998 when Dr Martin Seligman, an American psychologist, began to scientifically explore the possibility of harnessing a person’s innate desire to perform and live a happy life, rather than focusing on the negative. The phase ‘positive psychology’ is defined by the Positive Psychology Institute as: “The scientific study of human flourishing, and an applied approach to optimum function.” It is therefore a study of the strengths and virtues that enable people, companies and communities to thrive. Remember the adage – An apple a day keeps the doctor away? An age-old saying with plenty of merit! Apples contain a number of vitamins and minerals that are needed for healthy functioning of the human body. 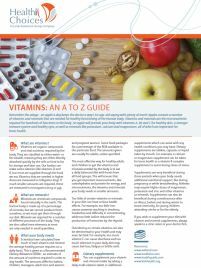 Vitamins and minerals are the micronutrients required for hundreds of functions in the body. An apple will provide your body with vitamins A, B6 and C for healthy skin, a stronger immune system and healthy eyes, as well as minerals such as potassium, calcium and magnesium, all of which are important for bone health. Are you contemplating joining a gym or walking club or perhaps starting a new sport? Most of us associate exercise with a healthy body and the desire to lose weight and improve our fitness levels, but it can be just as beneficial for a healthy mind. 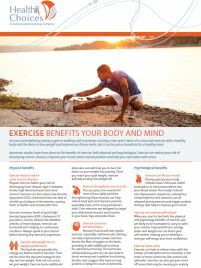 Numerous studies have been done on the benefits of exercise, both physical and psychological. Exercise can reduce your risk of developing chronic diseases, improve your mood, boost mental prowess and help you cope better with stress. Your health is in your hands. Prioritise regular, routine health checks that can help to detect any disease or health issues early. 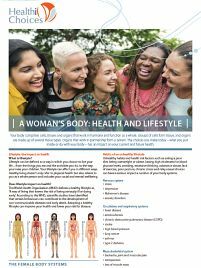 This will give you the opportunity to make positive lifestyle changes to prevent or manage health problems. There are lots of different health checks and screenings for various aspects of your physical health. 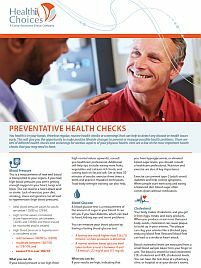 Here are a few of the most important health checks that you may need to have. Like Cinderella shedding her ballgown and glass slippers at the stroke of midnight, many of us see the heralding of a new year as the chance to start afresh. Unlike Cinderella who shed her finery for tatty rags, our metamorphosis is usually a positive transformation. We shed the regrets, mental clutter and negativity of the old year and embrace creativity, productivity and a fresh outlook. In order to see the impact these changes can have on you and on your life, you must make a firm commitment to see them through. 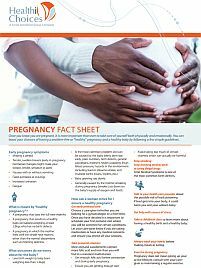 Keeping your family safety during this period should be a priority. Not only can accidents occur very quickly, people are also celebrating and enjoying their leave and may let their guard down. Criminals cash in on this festive feeling and strike – when you least expect it. 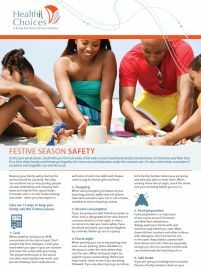 Here are 12 ways to keep your family safe this Festive Season. 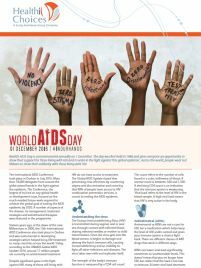 World’s AIDS Day is commemorated annually on 1 December. The day was first held in 1988 and gives everyone an opportunity to show their support for those living with HIV and to unite in the fight against this global epidemic. Across the world, people wear red ribbons to show their solidarity with those living with HIV. 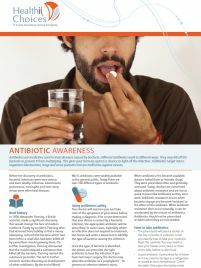 Antibiotics are medicines used to treat diseases caused by bacteria. Different antibiotics work in different ways. They may kill off the bacteria or prevent them from multiplying. This gives your immune system a chance to fight off the infection. Antibiotics target micro-organisms such as bacteria, fungi and some parasites but are ineffective against viruses. Mental illness is a term used to describe a number of mental health conditions that affect people of all ages, races and genders. The World Health Organisation estimates that one in four people will be affected by a mental health disorder at some stages of their lives. 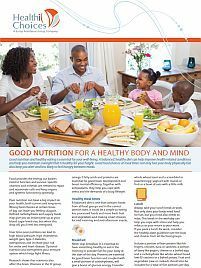 Good nutrition and healthy eating are essential for your wellbeing. A balanced, healthy diet can help improve health-related conditions and help you to maintain a weight that is healthy for your height. Good food choices at meal times not only fuel your body physically but also keep you alert and less likely to feel hungry between meals. 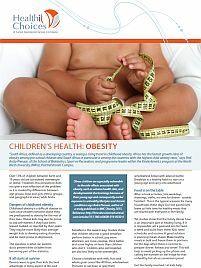 “South Africa, defined as a developing country, is seeing a rising trend in childhood obesity. Africa has the fastest growth rates of obesity among pre-school children and South Africa in particular is among the countries with the highest child obesity rates”, says Professor Anita Pienaar. Just one donor can save seven lives and help up to 50 people. 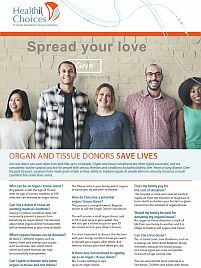 Organ and tissue transplants are often highly successful, and are considered routine surgical practice for people with serious illnesses and conditions including kidney, liver, heart or lung disease. People used to believe that you didn’t have to be happy at work to succeed. And you didn’t need to like the people you work with, or even share their values. “Work is not personal,” the thinking went. This just isn’t true.